Whether you’re recommending a student or a teacher, check out these free downloadable templates and samples that can be quickly customized to create compelling recommendations! Writing a letter of recommendation for students applying to college is something teachers love. After all, what’s more fulfilling than getting the kids you care about into great colleges? Our template is designed to ensure you hit all the points necessary to get your students into the colleges of their dreams with convincing reference letters. Simply download the free template as an MS Word document and fill in the designated sections with your students’ details. Click below to see our ready made example. It is my great pleasure to recommend Jonathan Baker for admission to the University of Connecticut’s Mechanical Engineering Department. I have known Jon for 3 years and was delighted to serve as both his AP Physics teacher and Robotics Club adviser at Greenwich High School. During that time, I watched Jon grow into an outstanding individual who excels in both his academic and personal pursuits. As Jon’s teacher and adviser, I witnessed his extraordinary ability to quickly understand advanced physics concepts and then adeptly apply them to real-world situations first hand. His senior year robotics project was particularly impressive: He designed, built, and programmed a robot that could climb any surface, no matter how smooth. Jon’s academic accomplishments are rivaled only by his personal strengths. His compassion and charisma are beyond his years and he is well loved by his peers as well as all those who have had the pleasure of teaching him. Whenever any of his fellow students are having a difficult time or feeling down, he never fails to step in with an encouraging word and a smile. I highly recommend you accept Jon into your Mechanical Engineering program. I am confident he will make an excellent addition to your university’s community. Please feel free to contact me if you have any questions regarding his character or past academic work. With college tuition becoming increasingly expensive, scholarships are sometimes the only way a student can afford it. 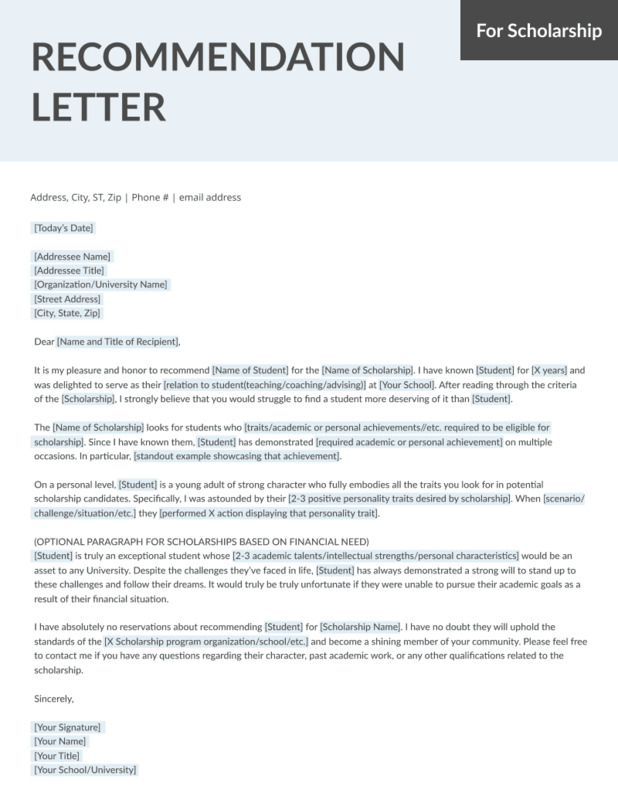 Make sure your student has the financial support they need to continue their education with a brilliant recommendation letter. Our template will help you accomplish exactly that—just download it as an MS Word document and fill in the details! Check out our example for some great ideas! It is my pleasure and honor to recommend Thomas Schriver for the Rhodes Scholarship. I have known Thomas for 2 years and was delighted to serve as his professor in my History course on Taiwan Politics and Cross-Strait Relations as well as his graduation thesis adviser at the University of Minnesota. After reading through the criteria of the Rhode Scholarship, I strongly believe that you would struggle to find a student more deserving and more in need of it than Thomas. The Rhodes Trust looks for students who possess exceptional scholastic abilities as well as the drive to use those abilities to their full potential. Since I have known him, Thomas has demonstrated his superior intellect and thirst to understand the culture and consciousness of his fellow man on multiple occasions. In particular, his graduation thesis—discussing the complexities of Taiwan’s history and how it has influenced the development of modern Taiwanese identity—was culturally sensitive and contained remarkable analysis that was eye-opening even for an experienced professor in the field such as myself. On a personal level, Thomas is a young man of strong character who fully embodies all the traits you look for in potential candidates. Specifically, I was astounded by his kindness, selflessness, and devotion to helping the less fortunate in any way he can. Every summer vacation, instead of using his free time for himself, he travels to Indonesia to do volunteer work teaching English to children living in rural villages. I have absolutely no reservations about recommending Thomas for the Rhodes Scholarship. I have no doubt he will uphold the standards of a Rhodes Scholar and become a shining member of your community. Please feel free to contact me if you have any questions regarding his character, past academic work, or any other qualifications related to the scholarship. Letters of recommendation for graduate school are taken even more seriously than those for undergraduate applications. Generally, they should be written by a professor who can describe a student’s capabilities and academic works in great detail. Our template for graduate school applications highlights exactly how to portray your student in a positive light. Download the template for free as an MS Word document and fill it in for a powerful recommendation that would be an asset to any student’s application. Read on for a completed example. It is my great pleasure to recommend Jess Chen for admission to the University of Iceland’s master’s program in Viking and Medieval Norse Studies. I got to know Jess as her Anglo-Saxon studies professor at the University of South Carolina. During that time, I was thoroughly impressed by Jess’ commitment to understanding and exploring the hidden depths of Anglo-Saxon culture and literature. While taking my Scandinavian literature course, Jess demonstrated an extraordinary interest and ability to analyze classic Icelandic sagas. Her final paper on the Bandamanna Saga was already on a level that would usually be expected only from a master’s student. In it she analyzed the Christian themes of Saga and explored how they relate to the current perception of Christianity in modern day Iceland. In addition to Jess’ exceptional academic accomplishments in Nordic studies as an undergraduate, her selflessness and commitment to helping the less fortunate made her an outstanding member of the University of South Carolina’s community. As a member of Habitat for Humanity, she provided invaluable tutelage and mentorship to countless underprivileged children. It is my strong opinion that Jess would be a tremendous addition to the University of Iceland’s Viking and Medieval Norse Studies graduate program, and she has my highest recommendation. Please feel free to contact me if you have any questions regarding her character or past academic work. If you’re writing a reference letter for someone applying for a teaching job, then you’ve come to the right place. 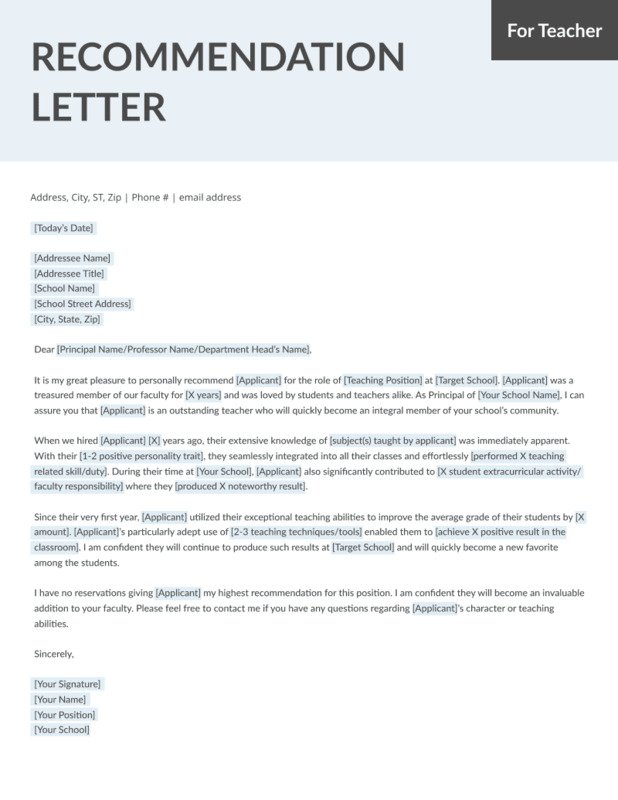 Our template will help you write a letter that will have any school or university begging to hire the teacher you’re recommending. All you need to do is download the template as an MS Word document and fill in the appropriate details for a persuasive letter that’s practically effortless to write. Read our completed example for some inspiration! It is my great pleasure to personally recommend Melanie McGregor for the role of 5th grade Math teacher at Wilton Elementary School. Ms. McGregor was a treasured member of our faculty for 6 years and was loved by students and teachers alike. As principal of Wilton Elementary School, I can assure you that Ms. McGregor is an outstanding teacher who will quickly become an integral member of your school’s community. When we hired Ms. McGregor 6 years ago, her extensive knowledge of mathematics and the learning needs of children were immediately apparent. With her kind-hearted and nurturing nature, she seamlessly integrated herself into all her classes and effortlessly engaged with all her students. During her time at Wilton Elementary, she also significantly contributed to the girls’ tennis team, which she coached to victory last year. Since her very first year, Ms. McGregor utilized her exceptional teaching abilities to improve the average grade of her students by one letter grade. Her particularly adept use of multimedia, advanced visuals, and practical storytelling enabled her to capture the attention of her students and ensure they were always focused on schoolwork in the classroom. I am confident she will continue to produce such results at Lenox Elementary School and will quickly become a new favorite among the students. I have no reservations giving Ms. McGregor my highest recommendation for this position. I am confident she will become an invaluable addition to your faculty. Please feel free to contact me if you have any questions regarding her character or teaching abilities. 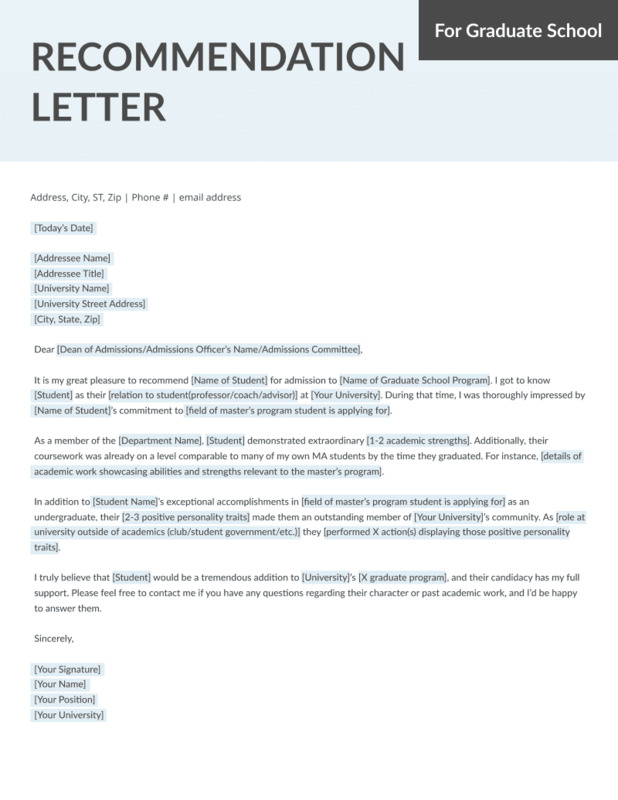 These templates and samples are all you need to quickly and easily write an effective letter of recommendation for any student or teacher. If you’re still fuzzy on the details, then check out our comprehensive guide on everything you need to know about writing recommendation letters.